A Term 39 weeker Male 3.5kg AGA baby was Delivered via Em LSCS for Meconium Stained Liqor with Apgar 7/10, 8/10 developed Meconium aspiration syndrome. 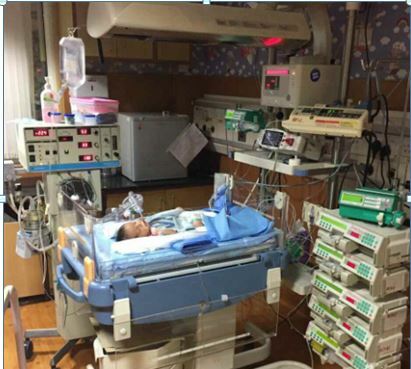 Baby had distress at birth and was referred to our center for possible need of ventilation. Baby was initially taken on CPAP @ 4 cm of H2O. Tachypnea was persistent up to 90/min with RDS score of 5/10. SpO2 was 93%. Baby was Intubated and was taken on SIMV @ 16 hours of life. 16 to 32 hours of life, FiO2 requirement increased to 100% and PIP reached up to 28, PEEP- 6 cm. Pre and post ductal SpO2 monitoring showed a difference of 9-12% , SpO2 was fluctuating. Pan Systolic murmur was heard over lt lower sternal border. In background of MAS- A Clinical Dx of PPHN was made. ECMO ( Considered when OI>25 and indicated at OI >40) None are available in our settings. First described in 1969 by Gersony et al. Previously described as “persistent fetal circulation” There is a systemic blood flow via fetal shunts(PDA and PFO) causing Systemic hypoxia. Earlier it was considered disease of Late preterm and term neonates but now being diagnosed in preterm neonates. With in the first 24 hours of life – signs of respiratory distress and cyanosis. Are neonates requiring extensive resuscitation at birth. Physical examination- cyanosis and signs of respiratory distress, meconium staining (skin ,nails, cord), The cardiac examination- Prominent precordial impulse, Prominent P2, A harsh systolic murmur of tricuspid insufficiency- lower left sternal border. –However, absence of a pre- and postductal gradient in oxygenation does not exclude the diagnosis of PPHN ( FO ). –PaCO2 : normal if no lung disease. Difference > 20 mmHg is suggestive. Findings of parenchymal disease, air leak, or CDH can be seen. Cardiac shadow typically is normal or slightly enlarged. Pulmonary blood flow may appear normal or reduced. Rule out structural heart disease and confirm a diagnosis of PPHN. –flattened or displaced ventricular septum- bulged IVS. –Continuous-wave Doppler – TR Jet: RV systolic pressure. Also used for Monitoring of therapy. Early recognition of PPHN and correction of factors that prevent decrease in PVR – late preterm or term infant with hypoxemic respiratory failure. A preductal pulse oximeter – right upper extremity and saturations are maintained in the range recommended by the NRP. Correct metabolic abnormalities- hypoglycemia, hypocalcemia, acidosis and polycythemia. Parental nutrition – glucose infusion rate, appropriate calcium and amino acid supplementation. Paralysis should be avoided as it has been associated with increased mortality. Due to underlying shunts, any stimulus can result in a precipitous drop in oxygen saturations. Covering eyes and ears and maintaining a low-noise environment is a common practice. Judicious use of sedation and analgesia – morphine, fentanyl or midazolam is recommended. BP should be maintained at normal values for gestational age. At high doses may be associated with elevation of PVR as well. Providing adequate oxygenation forms the mainstay of PPHN therapy. Preductal oxygen saturations 90-97% (PaO2 levels between 55 and 80 mmHg) is now recommended. SpO2 of 100% is avoided. –concerns of impaired cerebral perfusion and SNHL with respiratory alkalosis. Similar or better outcomes maintaining normal PCO2 (45–60 mmHg) with less CLD. Alkali infusion was associated with increased use of ECMO and need for oxygen at 28 days. Most centers avoid acidosis- pH < 7.25. Conventional and high frequency ventilation (HFV)- Reduce V/Q mismatch. –Comparison : neither mode of ventilation was more effective in preventing ECMO. HFV + iNO resulted in the greatest improvement – Specially RDS and MAS babies. Permissive hypercapnia and Normal oxygenation. Benefit was greatest –mild disease with OI 15-25. Recently, increase in use of surfactant in secondary PPHN and respiratory failure- reduced need of ECMO. Seldom HFV has been used in Nepal. Facility for ABG -24 hours. Ideally, Transcutaneous CO2 monitoring is used to prevent frequent Blood gas samplings. HFOV augments the response to iNO in PPHN associated with MAS or diffuse parenchymal lung disease (pneumonia, respiratory distress syndrome). In 1999, inhaled nitric oxide (iNO) was approved by the FDA for use in near-term and term infants with PPHN. Selective and micro-selective action of inhaled nitric oxide (NO). Inhaled NO is a selective dilator of the pulmonary circulation without any significant systemic vasodilation as it combines with hemoglobin to form methemoglobin. BNP – proposed early indicator of PPHN in the presence of respiratory illness in neonates without CHD. BNP had excellent sensitivity and negative predictive value for iNO requirement and above 30 ng/dl maybe a useful prognostic biomarker in PPHN. Is it possible to Start iNO in Nepal? Usually 3-4 Cylinders of NO is required per day. Two of the most promising therapies. PDE5 inhibitor. PDE5 present pulmonary vasculature. Sildenafil therefore increases cGMP within pulmonary vascular smooth muscle cells, resulting in relaxation. IV and Oral form- FDA approved for use in adults. Studies have shown that oral sildenafil (dose range 1-3 mg/kg every 6 h) improves oxygenation and reduces mortality, in centers limited by non-availability of iNO. –Loading dose (0.4 mg load over 3 hours), followed by a maintenance dose (0.07 mg/kg/h) reduces risk. Sildenafil may reduce the rebound pulmonary hypertension noted during iNO weaning. Not used in premature babies under window period for ROP- severe ROP reported. After 6-12 hours, the oxygenation improved – OI decreased over next 24- 48 hours. SpO2 improved- Pre and post-ductal. FiO2/PIP requirement decreased. Sildenafil was stopped after 8 doses. Baby was weaned to CPAP in next 48 hours and re-intubation was not needed. There was no hypotension noted at any time. All 3 were Term babies with MAS, 1 with MAS+HIE II. We started Oral Sildenafil via OG at 0.5mg/kg/dose and escalating to maximum 2 mg/kg/dose 6 hourly – 8 to 16 doses. There was no incidence hypotension. In all babies OI drastically improved over 12-24 hours. Ventilator parameters decreased gradually. Babies who were not maintained on Conventional ventilation initially were later weaned from MV to CPAP. Sildenafil as such seems promising drug. – is not currently licensed for use in treating PPHN. It inhibits PDE3 and relaxes pulmonary arteries. Infants with PPHN refractory to iNO therapy have responded to IV milrinone in case series. A loading dose (50 mcg/kg) followed by a maintenance dose (0.33 to 1 mcg/kg/h) is commonly used. BP should be monitored. Milrinone –may be choice in the presence of PPHN with LV dysfunction. (Cochrane: Milrinone). Among the available studies, no RCT met the criteria for review. The efficacy and safety of milrinone in the treatment of PPHN are not known.Use should be restricted within the context of RCTs. Non-specific endothelin-1 receptor blocker -Treatment of PPHN, mainly in adults. 11 newborns- Trial. A loading dose of 200 mg/kg MgSO4 was given over 20 minutes, followed by a continuous infusion of 20-150 mg/kg/hour to obtain a magnesium blood concentration between 3.5 and 5.5 mmol/l. Mean duration of treatment- 75.5 hours.. No other vasodilator was administered before or during the treatment and patients were not hyperventilated. A-aDO2 : 624.3 to 590 mm Hg. MAP 19.5 to 13.9 cm H2O after 72 hours. No systemic hypotension nor any other adverse effect were noted. All infants survived and the neurodevelopmental assessment was normal at 6 and 12 months of age. Magnesium sulphate is a non-aggressive and low-cost treatment of short duration which is easy to apply. The use of MgSO4 – not tested by RCTs. Evidence from uncontrolled studies does suggests a potential benefit, RCTs are recommended. Post-natal systemic steroids- shown to decrease the duration of hospital length of stay and oxygen dependence in MAS. Animal models- Potential role. Vasodilator- activating adenylate cyclase and increasing cAMP in pulmonary arterial smooth muscle cell. No RCTs evaluating the effect of these vasodilators and consequently their use remains limited in Neonates. 1.The Mortality related to PPHN has been declining(MR<20-25%, <1% for MAS).Severe PPHN in Neonates is almost a fatal case in resource limited settings. 2.Inhaled NO and ECMO not available. 3.Surfactant, Conventional Ventilation/HFV, Sildenafil, Milrinone, MgSO4 are available in our inventory. 5.Newer drugs and researches are on going- Hope for cheaper, effective and Safer drugs in future. 2.Uptodate.com: Persistent pulmonay hyperternsion in newborn 2016. 3.Persistent pulmonary hypertension of the newborn Vinay Sharma Sara Berkelhamer and Satyan Lakshminrusimha Maternal Health.